Just when you thought the SmartLight was the most flexible Tower Indicator light ever, it gets even more flexible with the addition of a new mode. This new mode is appropriately named “Flexible Mode”. The new Flexible mode enables two new applications: User defined segments and Point-of-use indication. 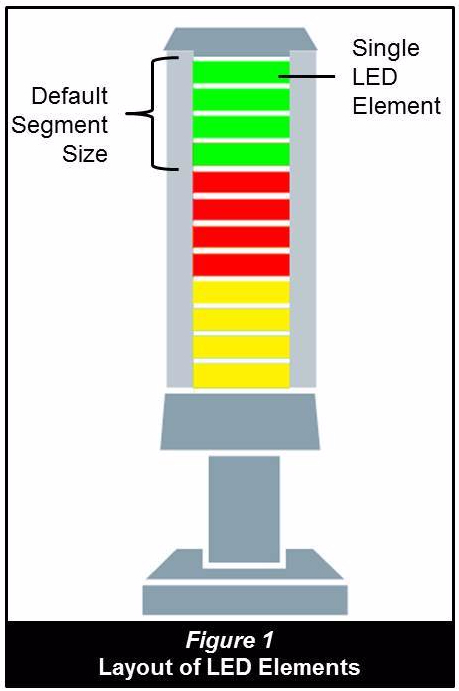 For traditional tower light applications, it’s now possible to define the segments as you see fit. It works by taking control of every LED element. Each SmartLight segment is comprised of four LED elements that can be controlled anyway you want (see Figure 1). For example, with the 3-segment SmartLight, you actually have 12 LED elements that you can organize any way you want. In Figure 2, we only use three LED elements per SmartLight segment, making it a four segment SmartLight. By using two LED elements we create six segments. Figure 3 is even more interesting, in this example we can see the size of the segments are sized by the intended users. Forklift Drivers need a larger light due to the distance and the fact that they are moving. 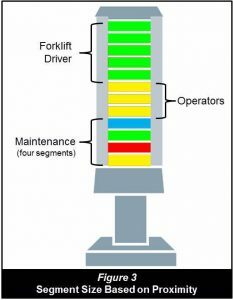 Operators are closer than the forklift drivers, so their segment can be smaller, and maintenance can use the smallest segments because they are closest to the SmartLight when working on the machine. In these types of applications, the SmartLight is used in close proximity, usually within the work envelope of the operators. In the example shown, the SmartLight is used in a socket tray application. The SmartLight indicates to the operator which socket is required for a specific task. Inductive proximity sensors connected to an IO-Link Hub verify the correct socket was pulled. The photo is showing an All-Call (all lights lit). 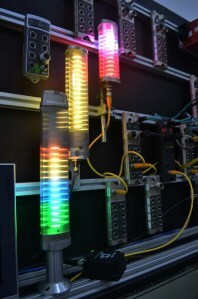 Here you can see the unique LED element grouping only available with the new Flexible mode. Other applications for operator guidance are essentially endless. There are no technical limitations to your creativity. The Flexible mode is available in all SmartLights with firmware version 3.0 or greater. So go have some fun! Learn more about the SmartLight at www.balluff.com. #5. Quick Change Tooling: The technology of inductive coupling connects standard IO-Link devices through an airgap. 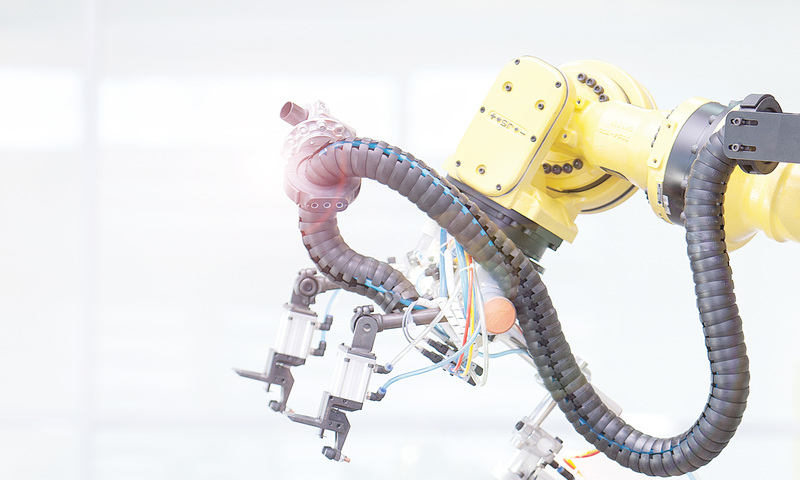 Change parts and End of Arm (EOA) tooling can quickly and reliably be changed and verified while maintaining connection with sensors and pneumatic valves. This is really cool technology…power through the air! #4. On-the-fly Sensors Programming: Many sensor applications require new settings when the target changes, and the targets seem to always change. IO-Link enables this at minimal cost and very little time investment. It’s just built in. #3. 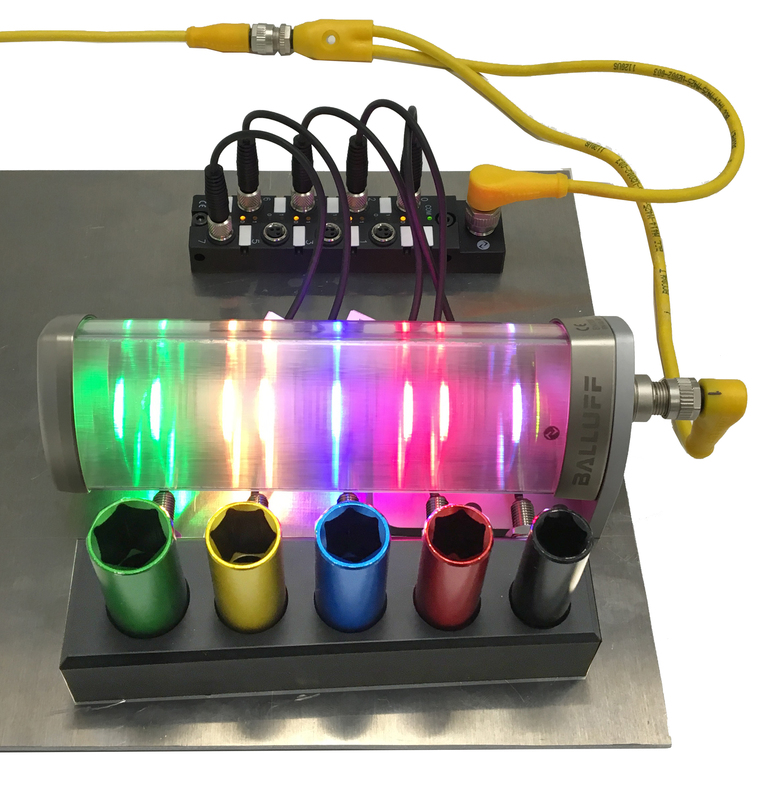 Flexible Indicator Lights: Detailed communication with the operators no long requires a traditional HMI. In our flexible world, information such as variable process data, timing indication, machine status, run states and change over verification can be displayed at the point of use. This represents endless creativity possibilities. #2. Low cost RFID: Radio Frequency Identification (RFID) has been around for a while. But with the cost point of IO-Link, the applications have been rapidly climbing. From traditional manufacturing pallets to change-part tracking, the ease and cost effectiveness of RFID is at a record level. If you have ever thought about RFID, now is the time. #1. Move Away from Discrete to Continuously Variable Sensors: Moving from discrete, on-off sensors to continuously variable sensors (like analog but better) opens up tremendous flexibility. This eliminates multiple discrete sensors or re-positioning of sensors. 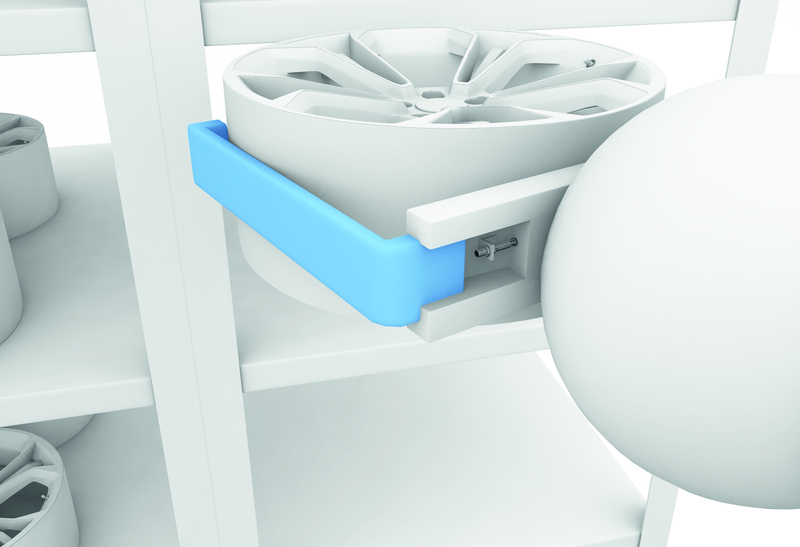 One sensor can handle multiple types and sizes of products with no cost penalty. IO-Link makes this more economical than traditional analog with much more information available. This could be the best technology shift since the move to Ethernet based I/O networks. So #1 was the move to Continuously Variable sensors using IO-Link. But the term, “Continuously Variable” doesn’t just roll off the tongue. We have discrete and analog sensors, but what should we call these sensors? Let me know your thoughts! 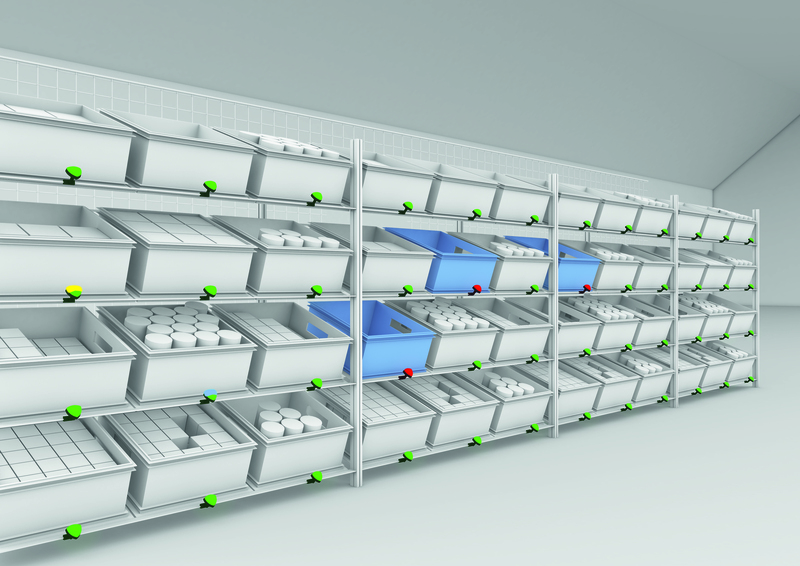 To learn more about RFID and IO-Link technology, visit www.balluff.com. Since 2010 we have been sharing best practices, technology and industry trends. Occasionally we have even gotten back to basics with how the products we use to automate actually work. As you know, we are dedicated to the successful implementation of sensor technology by the automation community. With the inevitable evolution of technology and the birth of the 4th Industrial Revolution or the Industrial Internet of Things (IIoT) we are excited to announce a few changes to the SensorTech blog. As summer kicks off we have decided to update our blog with a new look, and a new name. Introducing, Automation Insights. We are here to act as a resource for the industry as it navigates through the impending IIoT technology revolution, sharing information about emerging trends and standards, current best practices, success stories, technology fundamentals, and advanced implementation concepts. And we are here to offer expertise, ideas, guidance, and support for industrial identification and industrial sensor specifiers, installers, and users to help them get the most out of their automation technology investments. One thing that will not change, though, is our dedication to the successful implementation of industrial control technology by the automation community at large. We look forward to sharing many new posts with you and are excited for you to get to know a few new contributors from around the globe. Fortunately, the IIoT can help you avoid what you want to avoid and do more of what you need to do. The promise of IIoT can be realized with an IO-Link Architecture featuring Balluff’s Virtual IP address concept. This scalable architecture allows the PLC to do its thing while an independent PC (the one on your desk for example) can access the IO devices directly to get at operational and process data not always available in the PLC. On Sensortech, we have posted several entries about the trend toward miniature sensors including, Let’s Get Small: The Drive Toward Miniaturization and Trending Now: Miniature Sensors. At the end of January Balluff attended SLAS in San Diego, CA and saw this trend firsthand. 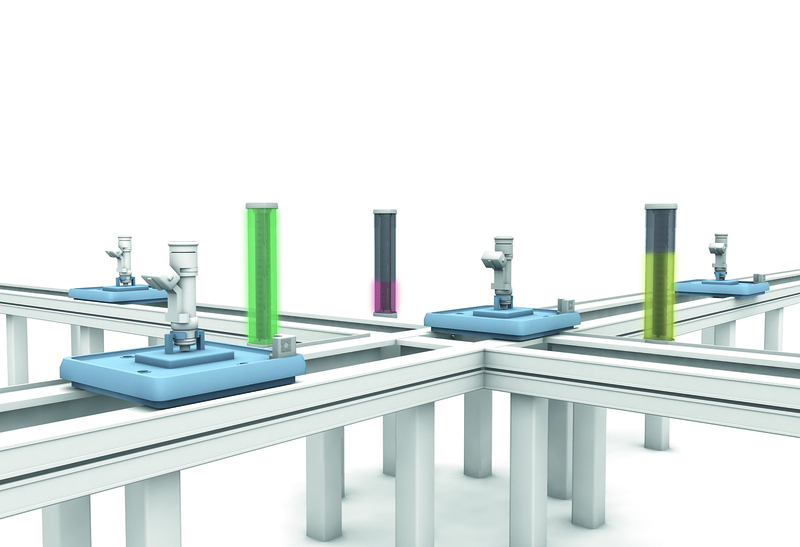 Automation in the clinical lab is growing by leaps and bounds. 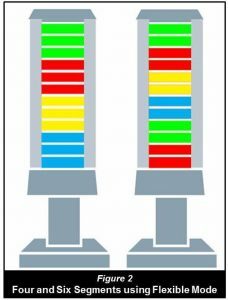 Bioscience engineers are facing pressure to reduce cost, increase the number of samples run, and improve the speed at which lab tests are performed. As an exhibitor at the event, we were able to showcase our solutions with a great functional demo. Below is a brief video of the demo with our Life Science Industry Manager, Blake DeFrance explaining the technology. For more information on solutions for the Life Science Industry visit www.balluff.us. One of the promises of the Industrial Internet of Things (IIoT) and Industry 4.0 is the visibility provided to the manufacturing plant floor. But what information is important and from what type of field devices? So we asked those two questions to our most progressive group of customers…IO-Link users. These customers have realized the benefits of IIoT and I4.0 through the enabling technology of IO-Link. 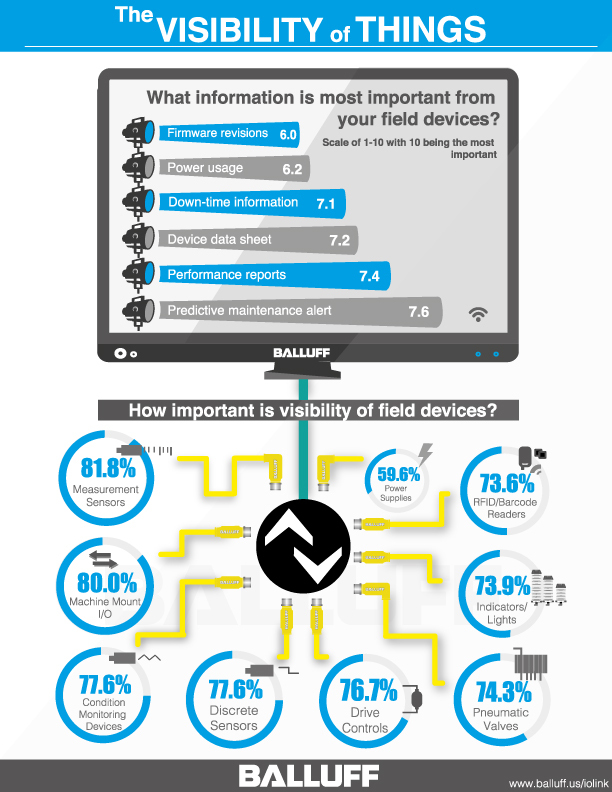 The included Infographic displays the most valuable information from the most critical devices. Not surprising that predictive maintenance information is viewed as the most critical. Examples of this would include sensors getting dirty or out of adjustment but still operational for the time being. Interestingly, firmware revision control made the top of the list. This appears to be a growing trend as more and more field devices have microprocessors creating revision control issues. As for the devices, measurement products were on the top of the list. That’s understandable as these products tend to be more costly and complex with parameter and calibration information. Most interesting were the good-old power supplies. These hard working, often forgotten products are critical, but obviously few people are concerned about how they are functioning. This could also be due to the fact that there are not many viable products on the market. Whether you’re a seasoned professional with IIoT and I4.0 or just looking at the possibilities, the enabling technology of IO-Link is here now. And better yet, it’s scalable to your needs. Have a look today at www.balluff.us/io-link. 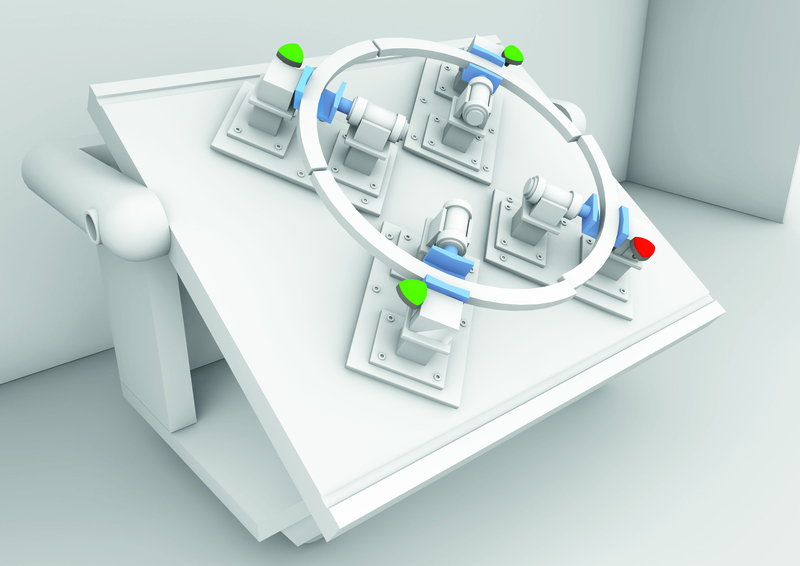 Example of a Flexible EOA Tool with 8 sensors connected with an Inductive Coupling System. Over the years I’ve interviewed many customers regarding End-Of-Arm (EOA) tooling. Most of the improvements revolve around making the EOA tooling smarter. Smarter tools mean more reliability, faster change out and more in-tool error proofing. 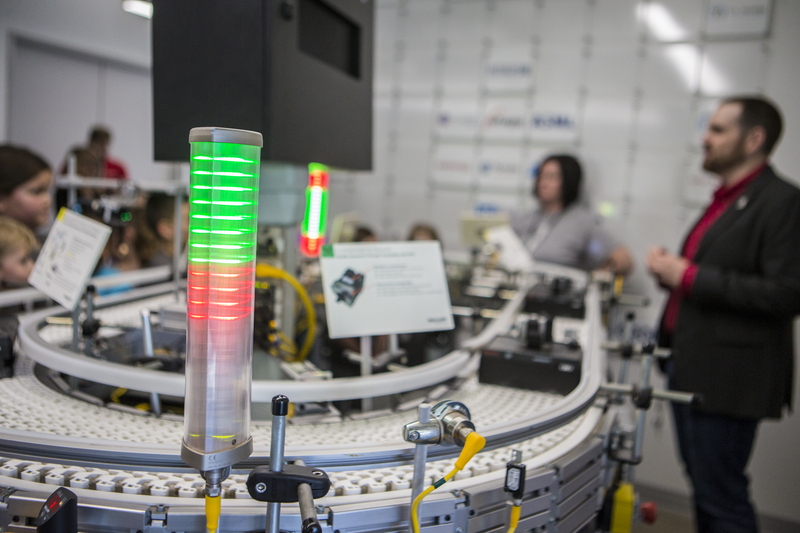 #5: Go Analog…in flexible manufacturing environments, discrete information just does not provide an adequate solution. 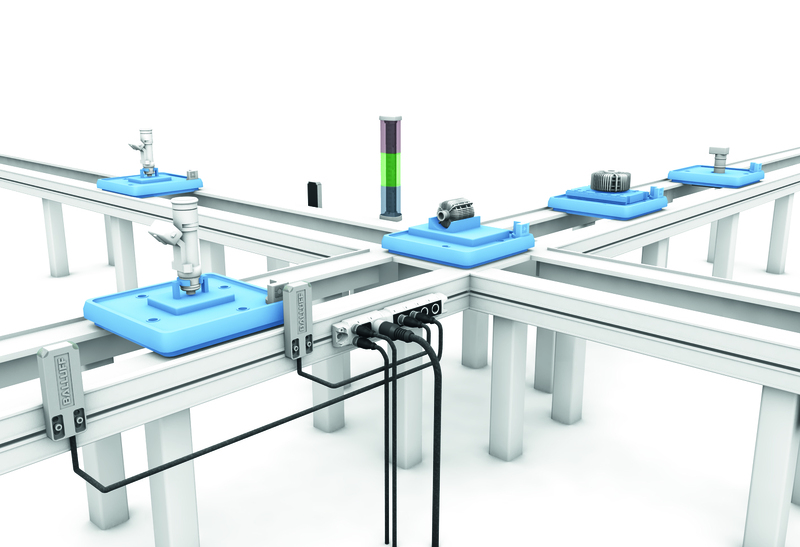 Analog sensors can change set points based on the product currently being manufactured. #4: Lose the weight…look at the connectors and cables. M8 and M5 connectorized sensors and cables are readily available. Use field installable connectors to help keep cable runs as short as possible. We see too many long cables simply bundled up. #3: Go Small…use miniature, precision sensors that do not require separate amplifiers. These miniature sensors not only cut down on size but also have increased precision. 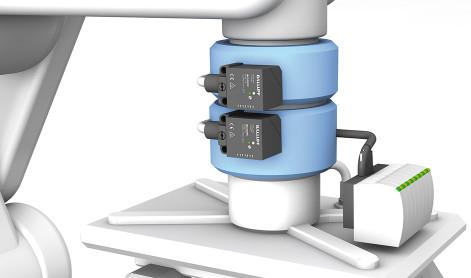 With these sensors, you’ll know if a part is not completely seated in the gripper. #2: Monitor those pneumatic cylinders…monitoring air pressure in one way, but as speeds increase and size is reduced, you really need to know cylinder end of travel position. The best technology for EOA tooling is magnetoresistive such as Balluff’s BMF line. Avoid hall-effects and definitely avoid reed switches. Also, consider dual sensor styles such as Balluff’s V-Twin line. #1: Go with Couplers…with interchangeable tooling, sensors should be connected with a solid-state, inductive coupling system such as Balluff’s Inductive Coupler (BIC). Avoid the use of pin-based connector systems for low power sensors. They create reliability problems over time. 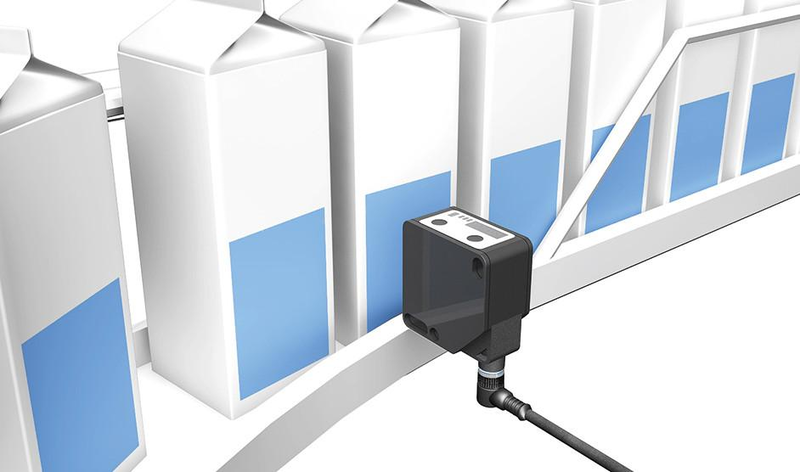 The goal of plant-based asset tracking is to reduce non-productive time and asset losses, while increasing overall productivity and utilization by accurately tracking assets. Bar code and RFID technologies track changes to an asset’s location, condition, conformity status, and availability.